Cheese is an all time favorite of most dogs. Often small cubes of cheese are used to reward our dogs to go into their crate, after a successful training session or to hide a pill or two. The strong aroma and flavor of cheese will get your dog to do just about anything you may ask of her. But serving cheese alone as a treat could be too much fat and calories for some dogs. Or it may be on the expensive side to give as a regular treat. That's where these tempting dog treat recipes come into play. Make one or all of the recipes below to stretch the flavor of delicious cheese. 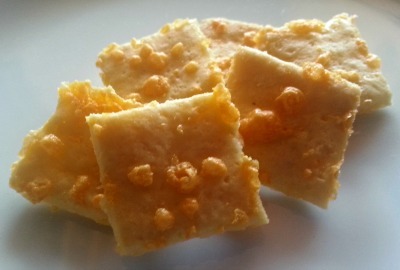 Our second dog treat recipe is loaded with cheese. 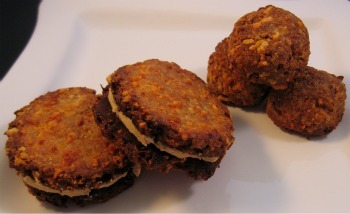 The treat has two kinds of cheese and the optional filling is loaded with cheese and peanut butter. 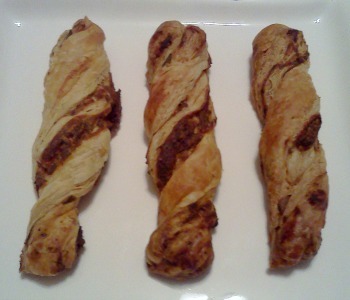 Last, but not least, our Cheesy Twists Dog Treats. You can make these easy dog treats more simple, by omitting the herbs, if you want. Two tablespoons of grated Parmesan may not seem like a lot of cheese, but freshly grated Parmesan cheese has a robust aroma that your dog will appreciate. Change up the organic baby food to sneak in a serving of vegetables in this homemade dog treat. If you're new to making your own homemade dog treats, or new to baking in general, you'll LOVE my two dog treat cookbooks. There are step by step photos, substitutions, and list of helpful supplies you'll need to get started. 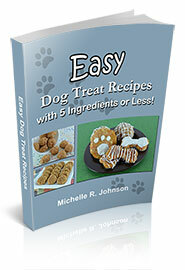 Read more about each of my cookbook eBooks, 15 Easy Dog Treat Recipes and my second eBook Dog Cake Recipes for Every Occasion to see how they can help you get in the kitchen and make the very best dog treats for your beloved dog. "You have sure put a lot of work and time into this website and I'm sure have helped lots others like myself. I love your website so much and have found it very helpful. Your site is to the T with the most helpful information. I go to it constantly as a tool. Thank you for providing such good information. I have asked several questions that have been answered so thoroughly and I also appreciate that."